Nicolai Alekseyev is an unapologetic gay Russian her. He is brave and fearless and will not back down from the fight. But I don’t think Nicolai and many others truly understand what a boycott is? Lets be honest. Yes a boycott is meant to financially hurt but in many cases those results are minimal at best. What a boycott really does is bring a spotlight to the issue at hand. 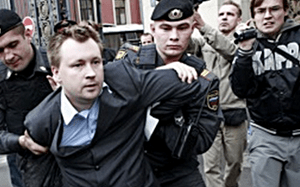 There has been more exposure and reporting on the human rights atrocities against Russian the russian LGBT community in the mainstream media in the United States and around the world in the past week since the beginning of the announcements of the boycotts against Stolichnaya Vodka and the Winter Olympics than in the past year. And this in return has and will bring pressure against the Russian government. So our actions are indeed working. Perhaps Nicolai does not see that from the inside of the country where he is. And while the Winter Sochi Pride is a great idea. Without the continuing controversy of using boycotts and protests against Russia from outside the county NBC and other news outlets would just ignore or be banned by the Russian government as much as possible to the Sochi Pride events. The spotlight and pressure must continue. And as much as I admire Mr. Alkseyev to stop now is dangerous and ill advised my opinion. Any means necessary to keep Russian’s crimes against humanity is the spotlight is needed before, during and after the Olympic games. Let us not forget what happened AFTER the 1936 Berlin Olympics: over 6 million Jews, gays, poles and gypsies were murdered in the Holocaust. World War II. The pressure must be kept on and everything that can be done, must be done.